Heat oven to 400°F. To make naan, place 2 biscuits between layers of waxed paper; roll into 8x6-inch ovals. Repeat with remaining biscuits. Brush ovals with 1 tablespoon of the oil. Place on large cookie sheets, oil side down; brush with remaining oil. Bake 7 to 13 minutes or until golden brown. Meanwhile, microwave frozen spinach as directed on box. In large bowl, mix spinach, chicken and 2 tablespoons of the seasoning mix. 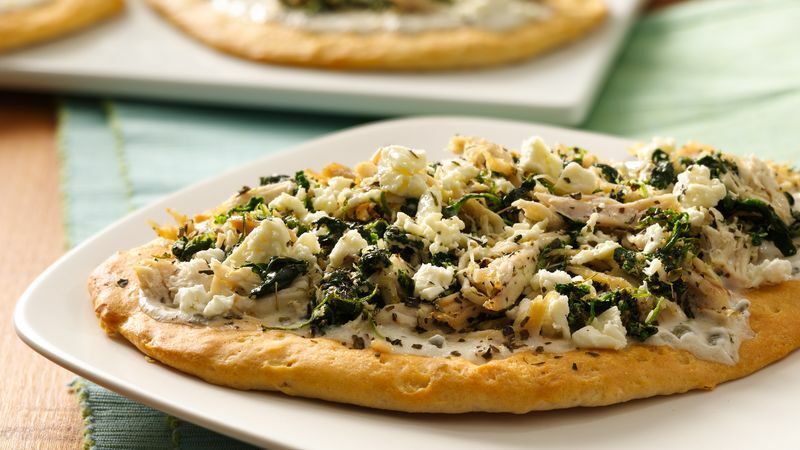 Spread 2 tablespoons tzatziki sauce on each naan. Top with chicken mixture, cheese and remaining seasoning mix. Bake 2 to 3 minutes or until thoroughly heated. Some Greek seasonings contain a high amount of salt. For best results, look for a Greek seasoning with dried herbs in your grocery store. Tzatziki is a yogurt cucumber sauce. Look for it in the dairy section of your grocery store.